This knife really rocks, it's the absolute perfect size for a constant pocket companion. Before this I thought that the ultimate knife would be a small Automatic, but after having this little pocket rocket my thoughts are now who needs one (besides even if it's legal to own an Auto in your state what happens when you travel). I really don't have a bad word to say about any of the feature of the knife, 154cm Stainless is great, the grip is good (but a little slippery when things are wet), the Axis Lock is the safest I have seen for either one handed or ambidextrous use, the lock is in the perfect position and easy to use, the blade studs are better than a spider hole and simple to open FAST. I have only sent the knife in once to Benchmade for sharpening, it came back quickly and the customer service people where helpful and polite. I do wise the scales where done in G10, but other than that it's Valox is light weight and does the job well. The Warn models do have G-10, get shopping! I have owned one of these mini barrages for over a year, really used and abused it. Its just the nature of my work in construction and not the knifes fault it has to take such a beating, but it does stand up to it all very well. I can see why people are saying the knife should have G10 and not valox plastic grips, they do scuff and gouge easily. Apart from that i could not be happier with it the 154 stainless steel really holds an edge and is very rust resistant. I did have to send mine back to benchmade for repair and despite the obvious HEAVY DUTY work the knife had been though they repaired it for FREE with NO Questions asked, it and the company have been great and i can honestly say that I have gotten my moneys worth out of this knife many times over. KO I am sorry it was never my intention to sell you or any one on anything, that is a decision that you will need to make on your own.This was simply an expression of my thoughts, feelings and experience with Benchmade and the knife that I own 585. But good luck with your search for a knife, I am sure that you will find the right one to suit you. I purchased the 585 plain blade(I didn't see any reason for semi serration on a 2.91 inch blade), it is the second Benchmade that I have purchased and over all it is a great little EDC. The position of the safety towards the front of the knife is in an ideal position and the Axis Lock System is without doubt the best in the market today. The steel being 154CM is a high enough quality that holds an edge and resists rust extremely well. The only shall I say let down is plastic scales (grips), they appear to be and feel like a hollow PLASTIC. 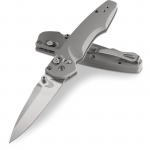 For the money I would have expected better of Benchmade considering that the knife is well engineered with stainless steel liners at an asking price of $130.00 (that is not what I paid for it off course). I do love this knife and it's one that I would recommend to others, especially if you like a little bit of chunk in your hand when using it. I purchased 585SBK several months ago, along with it I purchased a 587-1 SBK Warm (as a birthday gift for my son). Generally the knife is great, the action works flawlessly and at there size they do make for a very reliable spring assist pocket knife for ever day use. However my "Pet Peeve" was the CHEAP Valox Plastic Grips on the 585SBK. This brakes down to two main issues, firstly the CHEAP Honeycombed Injection Molded Valox Grips just don't stand up well to every day ware (even a drop on the ground will gouge them or worse). The other is they are too light to soak up the springs recoil (they really just don't feel like value for money in your hand, if you know what I mean). The bottom line here is what my Late Father use to say back in Australia, it's am matter being "Penny Wise and Pound Foolish", the reality is that this just pulls the knife up short from crossing the line to being a truly great knife. Benchmade should really take a good hard look at it's self, it's customers needs, wants and it's competition. I have spoken to Benchmade regarding this and they give two reasons for the using the Valox. The first is cost and that the knife would be fare more expensive with G10, there Asking Price is $145.00 and you get Cheap Plastic Grips.....!!! The other reason is that some customers want a lighter knife, this may be so but I do find it a little hard to believe after comparing the above. I was fortunate because I had purchased several (including a 587-1 for my son) I simply swapped the G10 Grip to the 585SBK that I wanted for myself and gave my son the 587-1 with the Valox and end-up with the perfect knife for me and what a difference .50 of an Ounce makes WOW..!! (but this is not an option that most people get). As to the horrible ware that shows up with Benchmades Black Clips, I have found the perfect solution. Just call them they will send you a FREE a Silver Split Arrow Clip that will not show up the scratches and that problem is forever solved...!!! The bottom line is that Benchmade's Axis Lock is in my opinion the best on the market, but that is not an excuse to cut corners. At the prices they charge there is no good reason to do so and is only going spoil what is a good knife and is NOT good business. I have handled the 581/586 (newer 580/585 with G10 and better steel) and the feel IS far better, it certainly IS noticeably heavier though. As far as the black clips, I agree they scratch and scrape. I just took mine off the knife and polish off the coating with some fine w/d sandpaper, = silver clips. Love this knife. Perfect size for EDC. Love the assist and the Axis system. Good steel and a great design. G10 or micarta would be nicer for the money and the scales on it do detract somewhat from the otherwise excellent overall build quality and feel of this knife. This was my first (but won't be the last) Benchmade. Ha, I'm back. Forgot all about this place and found it again by accident, and remembered I'd put a review or two on here. I've carried that 585 nearly every day for around 4 years now, I still love it just as much or more. Never had a problem with it. It's probably been flicked open 10's of thousands of times, I've spent hours and hours over the years just flicking it open and closed. Shortly after I got the 585 I got one of the big Warn version Axis with the 3.6" tanto blade and carried it in the other front pocket, keep it razor sharp for SD, and have always used the 585 for EDC tasks. Just upgraded to a 581 for the serious blade to retire the Warn, the 585 will still be there where it always is to do all the dirty work. I received my 585 mini-Barrage about 8 months ago and have alternated between it and my mini-Grip for every day carry. 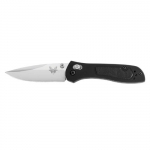 It is one of a few assisted opening Axis lock knives that Benchmade offers. The blade steel is 154CM, a good all-purpose steel that holds a good edge, yet is fairly easy to sharpen. The drop point blade has a decent belly and the 2.9" length makes it less scary to sheeple. The Axis Assist snaps open firmly and tension is applied through the entire range of motion, unlike their Nitrous assist. The handles fill the hand very well providing a comfortable grip. My two complaints about this knife, however deal with the handle and the pocket clip. The handles are a hollow Valox, and the knife sounds like a cheap plastic toy when opened, even though the Valox is incredibly sturdy and durable. The mini-Barrage could really benefit from G10 handles as a standard production option, not just the SHOT Show special. The only other shortcoming of this knife is that the pocket clip screws into thread liners that are glued into the scale instead of using longer screws that thread into the liner. Overall, it has almost replaced my mini-Grip as my EDC, and I am in the process of making some "micarta" scales to replace the plastic ones. The 585 has become my favorite EDC knife. I just picked up one of the LE 585-1 models from KnifeWorks a week ago...the difference is the handle scales are G-10 instead of the standard Valox used in the regular production model. 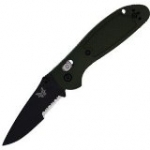 Being this is the first Axis assisted model, Benchmade's come up with a winner! This is a very solid, sturdy knife. Assisted opening on the axis lock is an awesome system. Opens very fast with a definite thud. Extremely well made & just a beautiful knife. I use it for EDC and you do notice its bulk but its certainly not uncomfortable in any way. Very sharp blade, haven't had it long enough to comment on edge holding yet, but 154CM is known for holding a good edge. Awesome knife! !